Ray Vincent has worked as associate chaplain at the University of South Wales for 12 years and has been a Baptist minister for over 50 years. Ray is in his 80s and speaks about the fear that he experienced as a young, gay man at a time when homosexuality was classified as both a mental deformity and a crime. 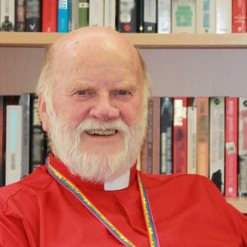 During his time at the University of South Wales he has: become Chaplaincy LGBT Champion; organised LGBT History Month events for several years; created the University of South Wales Staff LGBT Network (in 2015); introduced rainbow lanyards, which are now worn by over 2,000 staff members, and is a strong ally to all in the LGBT community.